– We removed the language selection from search because we were unsure of how to search user inputted data in different languages. Since the user input has no language type associated with it, unless it’s the default language, there would be no way to search for items in a particular language that is not the native language. This would be a nice feature to have in the future though. However, the Help pages might be written in different languages later on, so language search for help pages will be useful for that even if it can’t search through user content. – We added the search by content and projects. By default, from the simple search bar, it will search all contents and projects, so we made that the default for the advanced search. If the user want’s only one content type, then they ca deselect the “All” option which will also deselect all the other options as well. The same goes for projects. 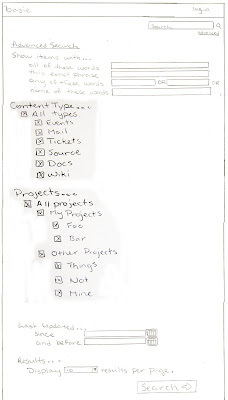 Selecting on the “My Projects” or “Other Projects” will select all projects under those headings, OR deselect. Those are the major changes that we made. Please comment on this! … Just not on how terribly I photoshopped that image together. This entry was posted on Friday, February 20th, 2009 at 7:28 pm and is filed under Uncategorized. You can follow any responses to this entry through the RSS 2.0 feed. You can leave a response, or trackback from your own site.